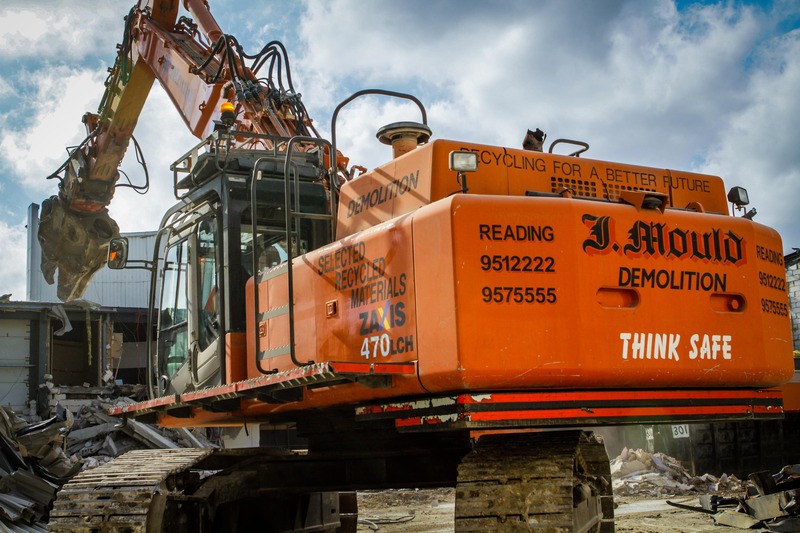 J Mould Reading (JMR) were awarded the sub-contract by Galliford Try (GT) who were acting as Principal Contractor for the project to demolish / deconstruct the former office building known as Energis House located on Forbury Road near Reading Town Centre. The structure to be removed was a 5 storey building comprising of 4 storey waffle floor slab with in-situ RC panels to side walls and a steel frame mansard roof incorporating the plant room. The building was sat on concrete columns which were piled into the ground. The building structure was situated close to the Great Western Route rail lines and, as per client request, JMR appointed a qualified Structural Engineer to act as CRE (Contractors Responsible Engineer) for the project who checked and ensured that all structural demolition works were risk assessed in compliance with Network Rail procedures. The structural engineer ensured tests of the ground conditions and of the structural integrity of the building were carried out prior to demolition works commencing. These records were kept as part of the temporary works pack controlled by the Temporary Works Coordinator. The Railway Infrastructure is operational 24hrs a day 7 days a week and its protection was allowed for in the planning of these works. The building was soft stripped during Phase 1 works prior to demolition, this reduced the risk of lightweight material blowing across the rail infrastructure. During this phase, fully encapsulated scaffold to the rear elevations of the building were erected by a specialist scaffold contractor and debris netting was fixed to further protect the railway infrastructure. Phase 2 consisted of the demolition of the structure using a 360 Demolition Excavator with a reach of 44metres. This was fitted with a suitable demolition cracker / multi-processor attachment and structure was demolished using progressive fragmentation method. The excavator was also fitted with a slew restrictor that prevented the machine from reaching the rail boundary. The building structure was demolished in sequence to ensure structural stability at all times. The scaffold structure was struck lift by lift with the demolition works ensuring that no more than one lift remained above the building at any one time.